Mark Adams is a registered respiratory therapist with CareLinc Medical Equipment and has served as a clinical specialist, clinical lead, and most recently as clinical manager in Grand Rapids. In August of 2016, Mark met Randy and Emily Berens along with their son Levi when he was being released from the hospital after spending the first 5 months of his newborn life in the NICU. That first week, Levi only required a dual monitor with continuous oxygen and nebulizer treatments to be able to be at home with his mom and dad. However, after only a few weeks, he then needed formula feedings from an enteral food pump due to poor nutrition. Mark was on-sight in their home to provide equipment training to the Berens family because that is what he does at CareLinc. Still, Mark is more than just what he does for a living, because he also provides compassion, empathy, and support to all the patients and caregivers he comes in contact with. This extra piece he gives is what makes the story of Mark and Levi special. Levi used CareLinc’s equipment and life went on for a couple of months. The week of Thanksgiving, Mark was with the Berens family in the NICU. During a routine procedure, Levi’s lung collapsed, causing an emergent tracheostomy to be placed and he was started on a ventilator. This procedure also started Levi’s stay in the PICU through the holidays and into the end of February 2017. Levi’s parents continued to search for answers that could help Levi breathe. This quest led them to a new set of doctors in Ann Arbor, where innovation is again influencing modern medicine. A recent article featured Levi’s progress with the 3D-printing advances made at Michigan Medicine. Miracles really do happen at C.S. Mott Children’s Hospital – just ask Levi’s mom, Emily. Levi has made major improvements over the last 16+ months, much to Mark’s delight. Emily and Mark have shared many tears together since they’ve met. However, recent ones seem to be joyous! 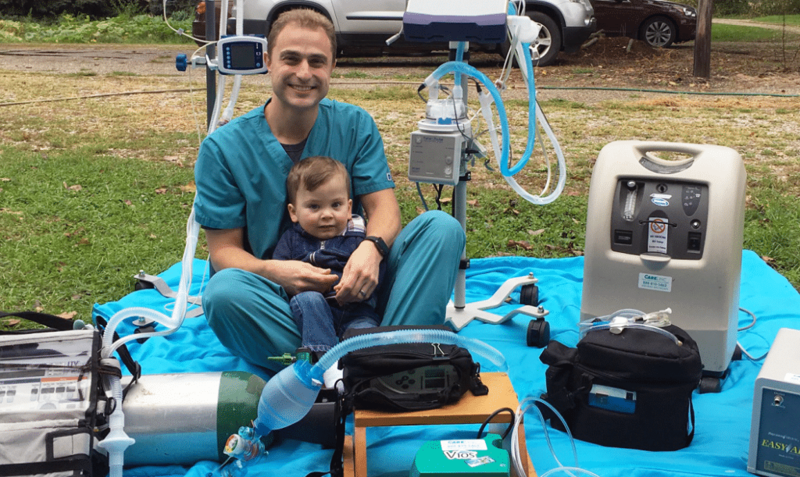 Levi is not only ventilator-“free”, but is scheduled to have his tracheostomy removed this month! “I continue to be humbled with the ability that we have to provide service to patients of all ages and needs,” Mark expressed while talking with Kirby Shotwell, Marketing Manager at CareLinc Medical Equipment, about his recent promotion to Clinical Director for the company. “Being able to be involved in the life of someone so inspiring is rewarding. I love my job and I love what I do here.” Mark went on to state that he knows he and Levi will stay in touch even once all the equipment isn’t needed anymore, “because that’s just what buddies do!” (And Mark smiled).